WHAT ARE YOU CURRENTLY READING? The Book Thief by Markus Zusak. It is the story of a young girl, Liesl, growing up in a foster family in Nazi Germany. She steals books, each of which are significant to her learning. It chronicles her growing awareness of the broader political context, including why her foster family is hiding a man of Jewish faith in their basement. It is hauntingly written and compelling in how it juxtaposes Liesl’s innocence, hope, and resilience to the horrific events of the time. WHAT DREW YOU TO IT? My mother grew up during World War II in Nazi Germany. She was four years old when the war started and so was oblivious to the broader events around her. With nine children in her family and her father in hiding to avoid Nazi orders to join the army, her parents focused on trying to feed them. During my own childhood, I struggled to understand what the war meant for my mother growing up but also felt guilt that my grandparents didn’t do more. The book has helped me to consider what they understood from day to day and how it differed from what we know looking back. FAVORITE BOOK TO ASSIGN TO YOUR STUDENTS? Fires in the Minds by Kathleen Cushman. It is an important reminder that while we focus so heavily on designing curriculum for kids, giving them agency and trust can yield incredible outcomes. FICTION OR NONFICTION? This is hard to answer. I read a lot of nonfiction because it fuels my work. I find it hard to stay put because I have conversations in my head with the author and often end up wanting to write. I love reading Atul Gawande because the ideas are compelling, but the narratives are powerful and engaging like fiction. FAVORITE PLACE TO CURL UP WITH A GOOD BOOK? The hammock, where I can hear the birds and insects all around me. 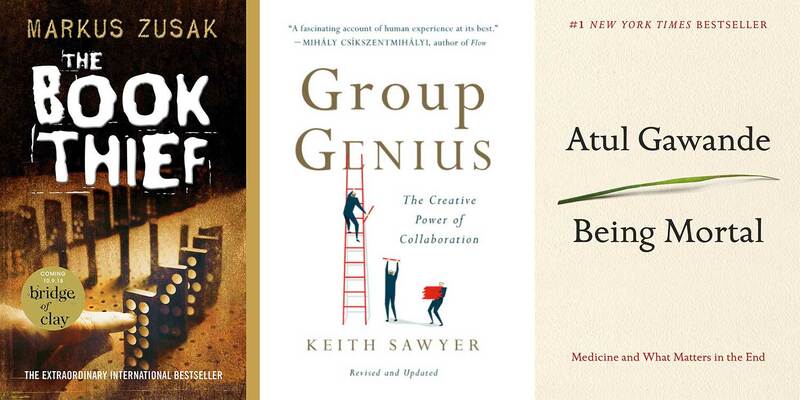 NEXT UP: Group Genius: The Creative Power of Collaboration by Keith Sawyer. I am really interested in concepts related to “group flow” and the dynamics that enable it. So much of what we focus on and reward in the world relates to individual accomplishment; we have yet to develop structures that fully explore or recognize the power of collaboration and collaborative flow.